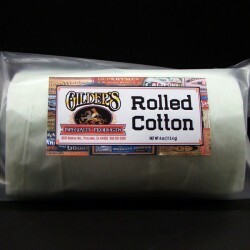 Buy Gilders Rolled Cotton for sale here. Gilders use the highest surgical grade of Rolled Cotton rolls for Burnishing Gold Leaf. 100 percent seed free to help burnish away gold leaf seams in a gild. Make sure you have used a Dusting Mop before hand to remove any flaps or excess dust. To Burnish with cotton, simply tear off a full hand size piece, then gently burnish-rub gold leaf in circles without letting your hand to touch. Inspect your cotton every 3 to 6 full spins, shake it or blow it off if any gold builds up. Remember Gold Leaf can scratch your gild, so keep checking your burnishing cotton for dust and or skewing s. Gold leaf will eventually build up turning cotton greenish-black, you can pull the cotton apart to reveal clean cotton to continue.